Posted on January 25, 2011	by Michael Gorton, Jr.
Those of you who know me, know I am not a huge Cabernet Sauvignon fan. There are a few I have had that are memorable and some not so memorable. I guess my thing with Cabernet Sauvignon is why is it the “it” wine. I find it heavy and oakey at times and a bit overpowering. It reminds me of a wine that MUST be consumed with food. I, however, like to consume wine by itself. There is nothing I enjoy more than searching the net, watching television or trying to read a book with a bottle of wine. I find it hard to do with Cabernet Sauvignon. This bottle of made me stop and pause and say to myself, I could drink Cabernet Sauvignon every so often. In fact, I said, I could drink Cabernet Sauvignon like this often. Waters Crest Winery in Cutchogue is a boutique winery that has no grapes on it’s property. Jim Waters — owner and winemaker chooses his grapes from various point on the North Fork. I wrote about Jim and his home winemaking gig turning mainstream over a year ago. He is that success story, from making wine as a hobby, retiring, and then moving on and making your hobby a reality. He would be my idol if I were a home winemaker. Waters Crest Winery 2007 Cabernet Sauvignon “Grand Vin” ($45) is grand indeed. The “Grand Vin” name is used for only those exceptional vintages. 2007 was just that and 2010 is going to be another. On the nose I picked up loads of blackberry and plum. Rustic and earthy with hits of menthol. When I say earthy, it is fresh turned earth. I was also picking up some barnyard aromas, something that I enjoy. Notes of tar, leather and fresh ground coffee arise along with hints of smoky meat and vanilla spice. There was a distinct aroma that reminded me of peppery pastrami. Velvety tannins and great acidity were balanced nicely. The tannins were showing stong at first, but with some time in the glass, they balanced out. I would love to taste this wine again in about 10 years. Dark berry bramble and plum dominated the palate with hints of menthol and smoke. There was a medicinal flavor that gave way to notes of dried blackberry and prunes. Fresh earth appeared with notes of dried herbs. The finish was long that carried a bit of a minty tart cherry flavor. This wine was packed with nuance and kept me in the glass for hours. To think that there were only 149 cases of this wine made. Some would say that $45 may be a lot to drop for a bottle of wine, but if you invest wisely and hold on to this young Cabernet for a while, you will be rewarded nicely years from now. Note: This bottle was given to me as a sample to review. 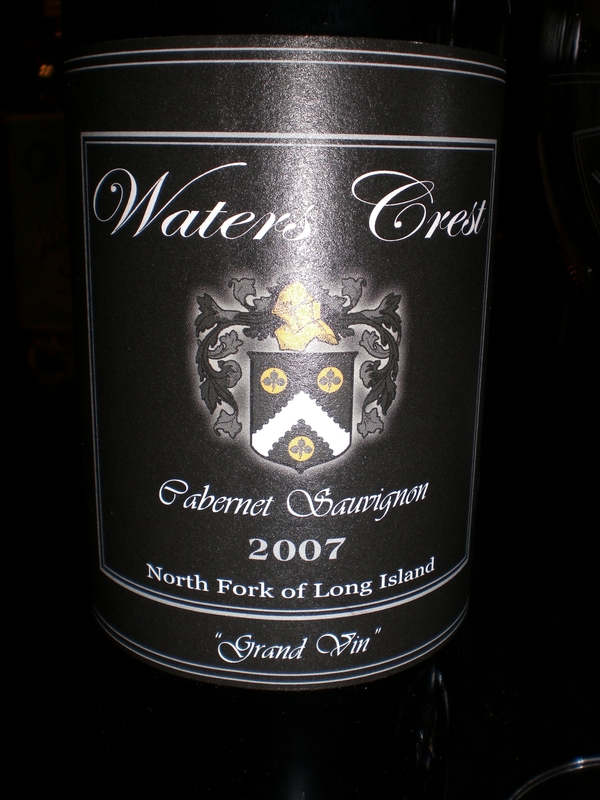 This entry was posted in 2007, Cabernet Sauvigon, Long Island, Waters Crest Winery. Bookmark the permalink.